We reached out to our most trusted car lighting experts to see what they think are the best fog lights. Read more about our top picks below. If you have any experience with fog lights, please leave a review of your favorite brands or vote for one of the others listed below. 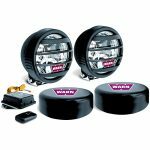 We selected the WARN W350F Halogen kit (check price) as the best fog lights for trucks, Jeeps and SUV’s. 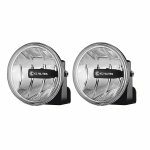 These halogen lights are only 3.5″ in diameter and stand 4.5″ tall, making them small enough to fit into almost any bumper configuration. One feature we really liked was that this set of fog lights is operated wirelessly. The kit comes complete with lights, mounting hardware, transmitter, wiring and a control switch that can be mounted inside the vehicle. If the thought of wiring your own lights intimidates you, don’t worry. The kit comes with a detailed set of instructions to walk you through the installation process, step-by-step. When I think of offroad lights, it’s inevitable that the KC brand comes to mind. They have been producing lights and accessories for the offroad market since the 1970’s and are considered the benchmark of quality. Have you ever seen those iconic yellow KC light covers on Jeeps or offroad trucks? Yep, this is the same company that makes fog lights for a wide variety of cars, trucks and Jeeps. We selected the KC HiLiTES 4″ LED fog lights (check price) as the best offroad fog lights because they have incredible durability and cut through fog with ease. They produce a total of 866 Lumens per light, giving you plenty of light when you need it most. These lights are completely street legal for use as fog lights, whereas other knock-off brands usually are not. I should point out that this specific model is universal so you can mount it on practically any truck or SUV. However, KC also makes this same style of light specifically for Jeeps, Toyota, Lexus and Scion models. 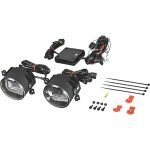 The Sylvania ZEVO Fog Light Kit (check price) provides a wide light beam to improve visibility and uses street legal LED lights. When you buy lights from a trusted brand like Sylvania, you can rest easy that their products are backed by a limited lifetime warranty if anything goes wrong. In contrast to many generic brands that sell imported fog lights from China, you never know how long they will last. Unlike other fog light kits for cars we reviewed, this set of lights is universal and requires no vehicle modification. However, if your current fog likes are molded into the bumper you may want to consider buying a kit that is designed for your specific vehicle. Driving Lights vs Fog Lights: What’s the Difference?